Decoration with nanoparticles creates intricate surface patterns full of nooks and crannies, twists and turns that greatly improve surface area. Image courtesy of the Stanford Nanocharacterization Laboratory. By “decorating” nanowires with nanoparticles, engineers at Stanford University were able to greatly improve surface area, resulting in increased electrical and catalytic performance. The hope is that technology like this may lead to better lithium-ion batteries, more efficient solar cells and improved catalysts. At the nanoscale, surface area matters a great deal in engineering applications like solar cells, batteries and, especially catalysts, where the catalytic activity is dependent on the availability of active sites at the surface of the material. 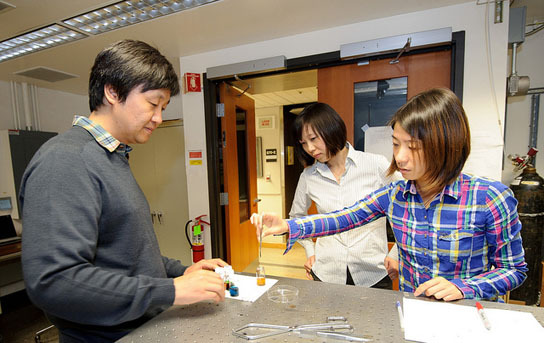 “Greater surface area means greater opportunity for reactions and therefore better catalytic capabilities in, for example, water-splitting systems that produce clean-burning hydrogen fuel from sunlight,” said Yunzhe Feng, a research assistant in Zheng’s lab and first author of the study. Other applications such as sensing small concentrations of chemicals in the air—of toxins or explosives, for example—might also benefit from the greater likelihood of detection made possible by increased surface area. Zheng and her team wondered whether a quick burst of flame might work better, so they tried it. Zheng dipped the nanowires in a solvent-based gel of metal and salt, then air-dried them before applying the flame. The in her process the solvent burns away in a few seconds, allowing the all-important nanoparticles to crystalize into branch-like structures fanning out from the nanowires. Using sophisticated microscopes and spectroscopes at the Stanford Nanocharacterization Laboratory, the engineers were able to get a good look at their creations. “It created these intricate, hair-like tendrils filled with lots of nooks and crannies,” said Zheng. 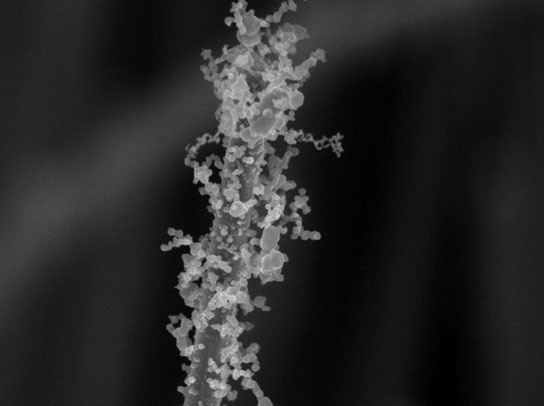 The bejeweled nanowires look like pipe cleaners. The resulting structure increases the surface many fold over what went before, she said. Prof. Xiaolin Zheng has discovered a new way to "decorate" nanowires with coatings of metal nanoparticles that greatly improve surface area. 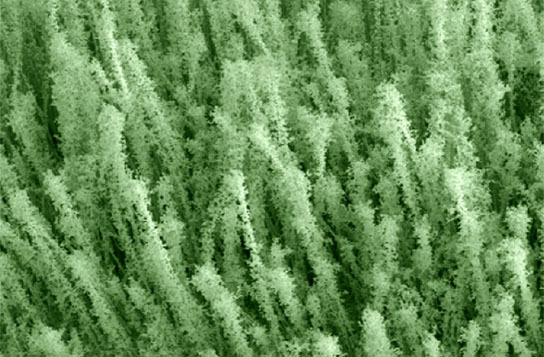 The decorated nanowires look like tiny pipe cleaners. Image courtesy of the Stanford Nanocharacterization Lab. “The performance improvements have so far been dramatic,” said In Sun Cho, a post-doctoral fellow in Zheng’s lab and co-author of the paper. Pratap M. Rao and Lili Cai also contributed to this research. The study was supported by the ONR/PECASE program. Be the first to comment on "Nanowires Covered in Nanoparticles Boost Performance"